 Bacteria are single-cell, living organisms that can survive without a host. They can live on surfaces, in soil, in water, and in the air. You can kill them by messing with their ability to do cellular respiration or their ability to grow. Antibiotics are used to treat bacterial infections because antibiotics kill bacteria. Most bacteria reproduce by simply dividing in to two. Bacteria can cause diseases such as pneumonia and food poisoning. However, not all bacteria are bad. In fact, some friendly types actually help protect us from disease. Viruses are not cells, they have no metabolism and they cannot survive alone. A virus is a chain of DNA (genetic material) and needs a host cell in order to stay alive. You can pick up viruses by touching door handles and other surfaces. Because viruses are contained in sweat or skin cells, one of the most common ways of catching colds and flu is by touching a surface that has been contaminated by a virus. Once a virus gets in to cells it tricks the cells to replicate it! Antibiotics are useless against viruses. If you have a virus, like a cold, a doctor would be silly to prescribe an antibiotic because antibiotics will not kill the virus! There are some antiviral drugs that help protect you from a viral infection. Antivirals either make it harder for the virus to get into the cell or they prevent the virus from reproducing once they are inside of your cells. ​Many human infections are caused by either bacteria or viruses. Disease-causing bacteria are called pathogenic bacteria. Many bacterial infections can be treated successfully with appropriate antibiotics. Not all antibiotics work to kill all types of bacteria just like not all types of bacteria can infect all humans. Some antibiotic-resistant strains of bacteria are starting to evolve as we use more and more antibiotics. Immunizations are available to prevent many bacterial or viral diseases. When infected by a bacteria or a virus your body’s immune system begins working to fight off the infection. Your immune system is composed of blood cells that either identify foreign proteins or blood cells that kill the pathogen. Antibodies are proteins that are made by immune system’s B cells. Antibodies recognize foreign proteins such as the proteins found on the surface of bacteria and viruses. Antibodies attach to the pathogen and signal T cells to destroy the bacteria. Each B cell makes a slightly different antibody and these different antibodies identify different proteins. When an antibody identifies a foreign protein it attaches to the protein and signals the B cell to make many many more antibodies. The B cell also replicates to make more B cells that will make the same antibody. The B cells also tell the T cells what antibodies to be looking for so the T cells know what pathogens to kill. Bacterial and viral infections rarely cause you to feel sick. The symptoms you feel, such as a fever, aches, and a cough, are really caused by your body’s response to the infection. When your body realizes it is infected it reacts by increasing the local blood flow. This causes inflammation, which can make you feel hot and stiff. Your temperature may increase as your body tries to make its internal environment too hot for the pathogen to survive. You get puss and mucus as white blood cells kill and clean out dead cells. Bacteria and viruses do very little damage to your body when compared to the damage your actual immune system causes. However, without your immune system the bacteria and viruses would build up to the point where your body could no longer function. Antibiotics can help the immune system kill off a bacteria infection but are useless against viral infections. Antiviral drugs work differently than antibiotics and are currently only effective against a few viral diseases, such as influenza, herpes, hepatitis B and C and HIV. Viral infections can be much harder to kill than bacteria infections because the virus actually goes into your human cells. The immune system can sometimes kill the infected cells before the virus is able to reproduce. However, as the virus reproduces it often kills the infected cell by exploding out which allows the virus to spread to other cells in the body. Immunization against viral infection is not always possible. Vaccines work by exposing your white blood cells to the foreign protein on a virus. Once your body has encountered a virus, and performed an immune response (making B and T cells) to the virus, it saves the B and T cells so that if the same virus or bacteria ever infects the body again, the immune system can stage and all out war, preventing the pathogen from ever making you feel sick. Vaccines introduce the body to the virus so that the body can save up B and T cells without ever making you sick. While we have vaccinations against many serious viral infections such as measles, mumps, hepatitis A and hepatitis B, some viruses – such as those that cause the common cold – are capable of mutating from one person to the next. When the virus mutates it changes enough that the immune system no longer recognizes it. The immune cells that were stored for killing the virus no longer recognize it as the same disease and they don’t know to kill it. This is how an infection with essentially the same virus can keep dodging the immune system. Vaccination for these kinds of viruses is difficult, because the viruses have already changed their format by the time vaccines are developed.